← Do We Have to Choose between Transparency and Real Authority? This is such a cheap, exploitative blog post that, really, I’m just ashamed of myself. But at least I can say it’s authentic. Like several other million people on the planet recently, I’ve been playing Angry Birds. I’ve completed all the levels, but haven’t gone back to get the 3 stars. And as I whiled away, oh I don’t know, maybe ten hours on the game, about half of them on plane flights, I got to thinking, there’s something about these crazy birds attacking the Pig Castles that’s like a metaphor for organizational change, more precisely for the quixotic charge of the rebel trying to bring down the status quo. And if you know me at all, I’ve yet to meet a metaphor I didn’t fall madly, if only temporarily, in love with. So maybe there are some people out there that haven’t played Angry Birds yet. Or, like I ten days ago, had only heard of the mania but hadn’t actually seen the game. So let me explain it briefly. These green pigs steal the eggs of some local birds. The pigs construct these Rube Goldberg-inspired castles to protect the eggs and assorted other treasures they pick up along the way. 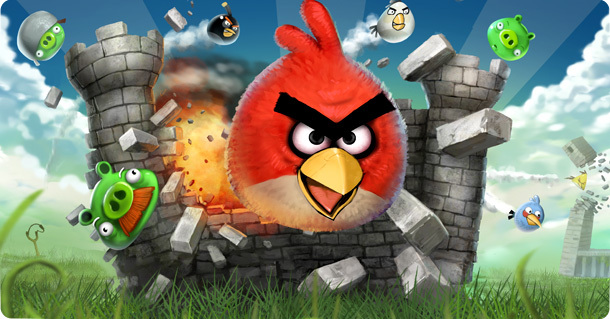 The now Angry Birds, which have unique offensive characteristics, launch themselves against the castles like Avian Kamikaze. Your task is to direct the birds in an optimum way against the pig castles until you bring them down. Here’s a nice little cinematic trailer that summarizes the setup. 1. It’s all about the angle of attack. Not all the birds are equally powerful, some drop bombs, some mirv into multiple birdheads, others speed up and penetrate the targets like torpedoes. But it’s rare for a bird, until the end when the Red Giants emerge, to be able to take down the Pig Castles or even do much damage unless you precisely aim it at a critical junction or weak point. We organizational heretics, we would-be topplers of the status quo really spend too much time on frontal assaults, getting beat up because we’re not willing to analyze the best place, time and way to make our arguments. 2. It’s all about trail and error. I know there are some gifted Angry Bird players who never waste a shot, but for most of us the sweetness of the game play is in the learning slowly, often painfully incrementally, the best way to get to the pigs. Here’s a part of the metaphor that doesn’t apply that well to organizational change. The rebels and organizational heretics certainly don’t get that many chances to reshape an organization. But we do usually get at least a couple. Observe what goes down very carefully. Learn from it. Share lessons within your rebel alliance. And then, like the birds, take a couple of aspirin, dust yourself off, and try again. BUT IN A DIFFERENT SPOT. 3. Stop banging your heads against Brick Walls. 4. Show some patience and let some of your moves play out over time. Angry Bird kamikaze attacks against Pig Castles often play out slowly. Sometimes when you don’t think you’ve landed a particularly powerful blow, the superstructure nevertheless begins to sway just enough to bring down the entire Château. 5. Resistance can be found in unexpected nooks and crannies. At the higher levels of Angry Birds, there can be upwards of a dozen pigs in the castle. Naturally, we concentrate on bringing down the obvious Pig Leaders, but even when we’ve used up all our bird attacks, a small seemingly insignificant pig lurks in the tall grass to defeat us. 6. It’s all about the sequencing. The larger Château de Cochon can require about ten Angry Bird attacks and many of your early launches appear to do very little damage to the superstructure. But your final assaults won’t succeed without those early attacks. All organizational heretics need to think hard about where to begin their campaign against the status quo. And organize it like a campaign!!! I think one of the things that kills change initiatives is that the status quo defenders have much better tactics and strategies than the change advocates. 7. Sometimes you just have to chip away. Anyway, that’s what playing Angry Birds taught me about organizational change. Any others? This entry was posted in Change, Innovation, linkedin, Organizational Dynamics and tagged Angry Birds, metaphor. Bookmark the permalink. sometimes you develop crushing momentum by firing two attacks at the same place. If a thing has wheels, it’s meant to move. If there’s a path that leads beyond what you can see, ask yourself, what’s down there? Excellent post. I love you analogy. Strong believe that we can learn from our behavior in games. Thanks very much for the comment. I appreciate it.